The DC3 Kappa Psi chapter of Phi Theta Kappa International Honor Society is proud to announce sophomore Vanessa Hernandez as Student of the Month. 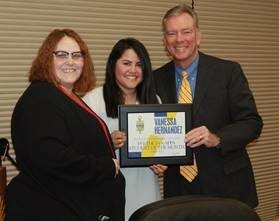 Vanessa is from Dodge City and is the daughter of Gregorio and Maria Hernandez. She is majoring in Biology, with plans to transfer to Kansas State University. While attending KSU, Vanessa plans to do research with the Developing Scholars Program and, from there, transfer to the University of Missouri Kansas City to complete her doctorate in dentistry. Vanessa has presented research that she conducted at KSU, with the RiPS program, at the 2018 Emerging Researchers National Conference and, in addition to her membership in and role as Vice President of Kappa Psi, she is also the Student Government Association President.